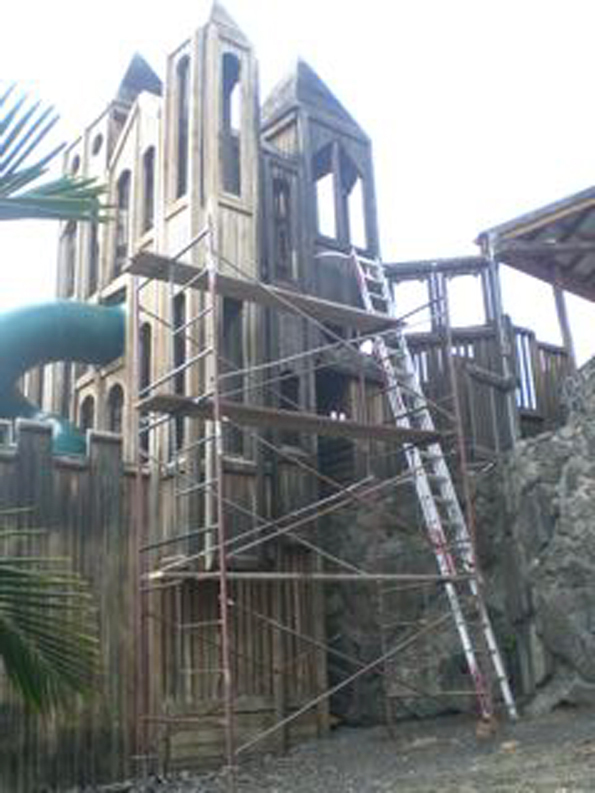 Renovation work on Kamakana Playground at Higashihara Park is entering its third week and is on track to re-open May 12. To date we have placed 50 ton of rock wall (with 20 ton to go), power washed all wood structures, begun sealing/staining of the wood structures (Hawaii Drug Court participants), completed flooring of the new bathrooms, placed a new roof on one pavilion, graded the south pavilion area in preparation of 22 yards of concrete being poured this Saturday for 160 feet of handicap accessible sidewalk, handicap parking, and a new second pavilion foundation. The new pavilion will be erected over the next two weeks with the assistance of the Hawaii Carpenter’s Union Apprentice Program. Next week, we begin much of the carpentry needs in the park including replacement of supportive ohia poles, construction of various fence lines, and construction of two horseshoe courts. We do need people with basic carpentry skills. As you know, it’s for Kona’s kids! Kopp also said he hopes to finish the wall along the south end would be finished in time to pour the concrete Saturday. And he sent an extra mahalo to Boston Basils for catering lunch for the volunteers. If you can help, call Kopp at 989-7072, or just show up ready to break a sweat.